You see this thing around a lot, paraded around by the right and the left. It recently made an appearance in the comment thread of the illustrious Dr. Robert Murphy. I just don't understand it myself. 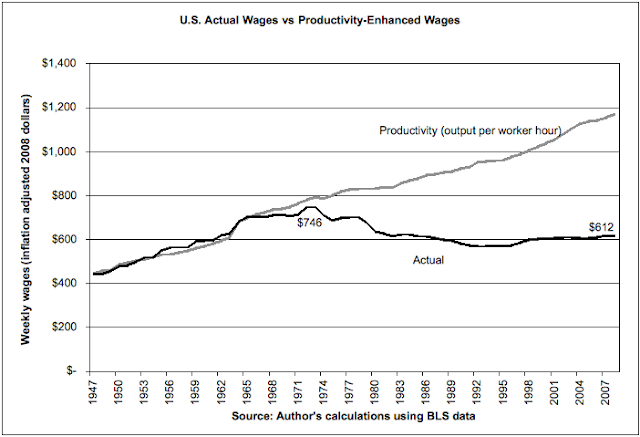 Real wages decoupled from productivity sometime in the seventies (some graphs make it look like it really came apart in the early seventies, other graphs make it look like it happened in the early eighties). The change is abrupt and persistent. Two series that used to follow each other closely don't anymore. That's not random - that needs an explanatoin of what changed. You hear two explanations: the weakening of unions and the end of Bretton Woods. I'm personally not sure how either is sufficient. Weakened unions makes some sense but (1.) that doesn't seem to affect enough of the labor market to do this, (2.) that didn't happen until the early eighties allegedly and clearly the seeds of this decoupling were planted before then, and (3.) you would think the weakening of unions would show the opposite of this graph: real wages higher than productivity switching to real wages that converged closer to productivity. So that's not entirely satisfactory. I don't get the Bretton woods thing either. OK, so there's some kind of inflationary free hand after Nixon closed the gold window, but so what? A money illusion would explain short run departures from productivity but why would you expect decades of lag below it? That doesn't sound like something money illusion would do. I'm guessing the answer lies somewhere in open economy macro, mobility of capital but not labor, and in that sense Bretton Woods is part of the answer. That's my suspicion, but my open economy macro intuitions are too blunt to figure exactly what's going on. But I don't think that the union ramblings of the Robert Reichs of the world or the inflation ramblings of the Ron Pauls of the world quite provide the anwer. This is a stark decoupling, which makes me think the answer has to be spelled out clearly out there somewhere. (1) There is evidence - I'm in a rush at the moment and don't think you will dispute it, but will find it if you need - that union membership benefits non union members quite a lot, too. (2) Broadly true, although there appear to be a couple of sudden changes after the initial decouple, possibly owing to the unions. (3) This only works if you assume the MVP. It makes perfect sense if you believe the distribution between labour and capital is determined by political power. Perhaps productivity gains are enabled by automation, and wage decreases due to a shift from skilled to unskilled labor? I suspect the weakening of unions is due to both automation, and globalization (unions have less leverage). Thus, the weakening of unions, and the drop in wages are each a symptom of the same effect? This is all fine, but then why the close correlation before the 70s and the departure afterwards? A discontinuity like that seems to merit a discontinuity in the explanation as well, which is the advantage of raising the issue of Bretton Woods. I just can't figure what about Bretton Woods would be doing this, and the inflation hysteria doesn't seem like it does the trick to me - it doesn't seem like it should drive the persistent departure. Although, robotics was an emerging technology in the 70's and would be expected to shake things up, I'm not sure that the prevalence of robotics was early enough to explain the point of initial discontinuity in the figure. I expect the emergence of personal computers in the 80's would accelerate the trend. It might be enlightening to examine the capital budgets for factories over the last several decades to see how prevalent automated equipment (robotics) has become. I'd assume that the increases capital costs would track the difference in the two curves (although be less than the difference between them). I think unlearningecon has it just about right with his #3. To expand on that idea, union wages will not necessarily grow faster than productivity. Unions are able to capture a greater proportion of the rent in noncompetitive industries. This rent presumably rises at about the rate of productivity. This does not mean that the proportion they capture grows too. Unions in competitive industries don't have any surplus to redistribute and so union membership would simply ensure that members get wage increase consistent with the marginal product. I'm parroting this from Freeman and Medoff's "What Do Unions Do". Also, that is a chart for real wages so it makes sense that the inflation of the 70s would be the catalyst for a decoupling of real wages and productivity since it sets up the conditions for real wages to grow slower than nominal wages with out anyone really having to do anything. Also, from a technical perspective, if wages and productivity are difference stationary, then wages will trend upward alongside productivity until it doesn't. It can make a gradual process look like a sharp break. "Unions are able to capture a greater proportion of the rent in noncompetitive industries. This rent presumably rises at about the rate of productivity." Could this just be a relic of the data and methodology? The productivity measure is a mean (sum of output divided by number of hours worked). Conversely, the weekly wage measure is probably a median measure. I think it would be more appropriate to compare the mean weekly wages to this productivity measure. As I recall from a review of 'the Great Stagnation,' while median wages are stagnant, mean wages aren't due to increased positive skew in the wage distribution. So, perhaps there is not decoupling between mean productivity and mean wages. I study finance, so I don't know the theory between wages and productivity, but this graph, as is, does not seem to support any theory (coupled vs. decoupled). I should check the source of this graph... I've seen several versions of it, but I hope people aren't just putting in median wages and mixing means and medians. If that's what's going on then distributional changes alone could explain this. I just assumed no one would mix means and medians like that without being very clear... probably a bad assumption on my part. Not sure if that really changes anything since that stagnation is consistent with stagnating median annual incomes. One would not argue that we should be shifting the analysis of the "middle class" by shifting to average annual income. Oh, btw, one factor you missed in your musing was the labor supply shock of baby boomers entering the workforce in the early 70s. Anyway, it seems reasonable to ascribe the kink to an interplay of all the factors being discussed. So why would the shock cause the departure of wages from productivity...? Its a new tier of workers (younger and more female) that makes it easier to institutionalize the change in bargaining, as you put it. I'm not offering it as a primary causes, but as part of the matrix. Did women entering the workforce increase? Did the structure of migration to the US change? Was there a dramatic increase in part time work? Was there a major shift in the composition of employment? Same question as above... certainly we had women entering, but why would that cause the departure of wages from productivity? Same with part time and compositional issues. This seems like it has to be a change in bargaining or the way prices are set, not compositional changes. I am really puzzled. What makes you think that unions are able to get wages in excess of productivity increases. There is no evidence of such. That someone will do the work for less says nothing about productivity. May I suggest two thoughts: First, the distribution of income is always and solely a political question, based on leverage created by political advantage. Second, there is no law of economics that says that productivity is rewarded. 4) taxes and transfer payments. Well I don't see why unions have to have wages above or below productivity levels (I could see either way). Why would bargaining without unions lead to wages below productivity. My bigger question is the close correlation between wages and productivity. What about union bargaining explains that? Even if unions get weaker over the closing decades of the 20th century, how does that explain the sharp break? I'm not sure what the political power of the rich or intellectual property have to do with wage setting behavior. This is an incredibly difficult question to answer. Cross country comparisons may help, as may comparisons with other eras. I could speculate all day about possible causes just like anyone else, I don't think I'll bother. Just because it appears to happen all at once doesn't mean that it has a single cause though it does make it more likely. As Daniel points out where the break occurs changes depending on what statistics are used. Like the whole "stagnation of median income" thing it will depend a lot on what counts towards wages, the BLS statistics are very restrictive about that. There has been a gain in frequency of the boom-bust cycle. During the boom, gains accrue towards capital. During the bust, concessions are wrung out of labor. I'd add tight monetary policy by central banks (Fed, ECB, BoJ). The one period where labor shared producivity gains is the late 90s when the U.S. had tight labor markets. Perhaps Greenspan held rates low in response to the 1997 East Asian financial crisis and this resulted in unemployment around 4 percent. It would be nice if it were anything as simple as unions. If Harvey's work is to be believed however, it has to be something more. In 1973, the highest influx of debutant shiksas the world had ever seen, and possibly will ever see, went up for grabs and the Portnoys of the world would not be denied regardless of the consequences for themselves or the world. "I remember when I got to Harvard in 1972, and all my outsider Jewish energy was focused on tearing down the WASP bastions that kept me back. And we tore them down." Weiss doesn't mention the sexual dimensions of this deconstruction of WASP citadels, but he hardly needed to to since that had already been covered by the other Philip (Roth) in 1969. Demoralization of the bulk of the non-Jewish, Boomer males was the proximal result of this Jewish victory, and the ultimate result was the permanent slow-down in productivity growth starting in 1973. "And now the two forces, Industry and Finance, are in a struggle to see whether Finance is again to become the master, or creative Industry. This is one of the elements which is bringing the Jewish Question to the bar of public opinion."